So here we are again, the final day of 2015. As expected, numbers on site were slim but some progress was made by the DMU team on firstly repairing a defective door on centre car 59303 and then by washing 'the bubble' after it sitting idle for several months with the defective vacuum cylinder. Progress was made on the station too with various new signs being put up and old ones being removed in preparation for the Booking Office move. The new 'Welcome' sign was also installed above the door and it looks excellent. Unfortunately, the fading light (and a passing monsoon) prevented a decent photograph being obtained so maybe tomorrow. Coupled to all of this activity, some of the poster boards on the fence which has been removed were recovered and the 2016 Timetable posters were distributed around the remaining poster boards. Mid-January saw the completion of the project to relay the unusual three way point in the yard after the timbers had become life expired. This was also the first time progress was made towards the conversion of the former Tannery into a Booking Office. More track work followed at the end of the month with the relaying of another point further down the yard. February saw Clayton Battery Locomotive "Sophie" arrive courtesy of MyTestTrack.com and contractors made a start on building a lovely new retaining wall to the west side of the bottom car park. It was a busy old time for this area as we had overhead gantries for electric railways by the end of March, yet another venture by MyTestTrack.com. Whilst all of this was going on, the BSK team worked long days to push forward to bring us our first ever on train kitchen in the guards compartment of the BSK. The Circus came to town at Easter in April with the Party Workshops Family Circus proving a hit with the public (so much so that they'll be back this Easter) over three days. Meanwhile, down at Shuttle, S&T department spent April installing ground frames for the loop which would later see service in the same year. The late May Bank Holiday saw our busiest public day of the year as Wirksworth Carnival rolled into the car park with it's various floats, bands, acts and followers. It was rammed! A few days later, we welcomed 33013 "Swordfish" to the railway which was brought it to operate our new Afternoon Tea trains which were to begin shortly afterwards. The locomotive proved a firm favourite with both the crews and the public and performed excellently each Tuesday for the tea trains. It was a great moment when our first Afternoon Tea train departed Wirksworth at 14:15 on 2nd June. The chaps had worked unbelievably hard to get the kitchen ready and stunning it looked too. Buffet staff and other volunteers continued to provide an excellent Afternoon Tea service each Tuesday until the end of September. The last week in June saw our first foray into a mid-week special event in the form of the 1950s Week. It was met with moderate success in the glorious sunshine of the time. Also during this week, we ran our first ever Murder Mystery evening special which was professionally acted by Broken Pipe Productions. Look out for this in the 2016 programme too! July was a very busy month as one would expect. We had the usual Classic Bus Rally and Classic Transport Weekend events, both of which were very successful and enjoyed by all. We also hosted our first ever wedding reception party as Kaye and Matthew got married near to Duffield Station and used the train to get to their reception at Shottle. It was a glorious day and everybody was very complementary about the time they had on the railway. Throughout this time we also operate 6 steam-hauled dining trains to Shuttle and back dubbed the Shottle Soiree. The meals were served on Friday evenings and all six evenings were sold out and my thanks go out to all of the teams who put these on as some late nights were had! The Permanent Way team busied themselves in Wirksworth yard in August laying a new point for what was to become Taylor's siding. 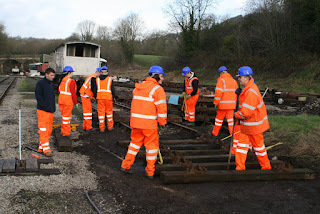 Track kindly donated by Celanese at Spondon was to be used to great advantage in reconfiguring the yard and volunteers had spent many hours down at their site in Spondon recovering the components. The DMU team had all on September to finish their project on 50253 which was finished just the day before the Multiple Memories DMU gala. They worked until around 23:00 to finish it alongside 53599 which had been in for a repaint. The gala hosted the Railcar Association's Annual Convention and also saw another first - the first public operations using Shottle's loop. This was fantastic and was a great success. Some lessons were learnt which partly sparked off the new timetable for 2016 but it was fantastic to have busy trains passing. The gala also saw another experiment at Duffield too, with the BSK's kitchen being used to serve high quality breakfasts to the public whilst they sat on the picnic benches. Aside from the ever present Model Railway Exhibition, October saw the arrival of another loaned locomotive in the form of Class 25 D7629. This has already covered a few duties in the winter but will see some action in the summer. However, it goes without saying that one of the most special things happened in October with the visit of His Royal Highness Prince Charles, the Prince of Wales. This was such an honour for the whole railway and it was made even more special by his representatives approaching us to organise the visit rather than the other way round. That was certainly one to remember! And as we've just passed another successful Santa Season all I can do now is wish everybody a Happy New Year and thank them for all of their hard work and drive in 2015. 2016 should be yet another interesting year with the impending remodelling of Wirksworth Station and maybe even Duffield too! 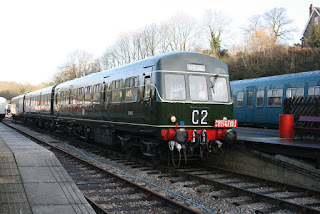 Maybe you'll join us for a fizz and mince pie on the train tomorrow but remember it's our new Blue timetable tomorrow with departures from Wirksworth at 11:05, 13:05 and 15:05 or 12:12, 14:12 and 16:12 from Duffield. The only activity on site today was the delivery of our final Santa Specials of the season as we delighted all who travelled on them. The Santa season takes alot of hard work and dedication by all of the staff who make them happen so I would like to thank them for their efforts. 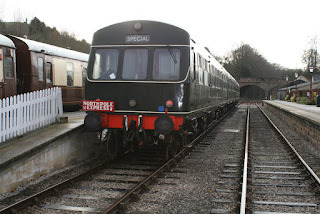 We'll be back on Tuesday 29th with the outgoing 2015 winter timetable service of 10:15, 12:15 and 14:15 from Wirksworth or 11:15, 13:15 and 15:15 from Duffield. Only two more to go before the Festive break !! The PWay team. battled the elements to complete rail cutting at bridge 11 between Idridgehay and Shottle. was summing and I continued stripping. Well that's the short version anyway, now for the l o n g one. and slipped all the way back. and a stop mark fitting then she'll be fit for purpose. Christmas wishing everyone seasonal greetings. I ventured into the LMSCA container and put the electric fan heater on. stripped (well you didn't think it was me did you!) of old varnish. the sky went blue and the sun came out! the monsoon season will soon be over and the days getting longer once again. 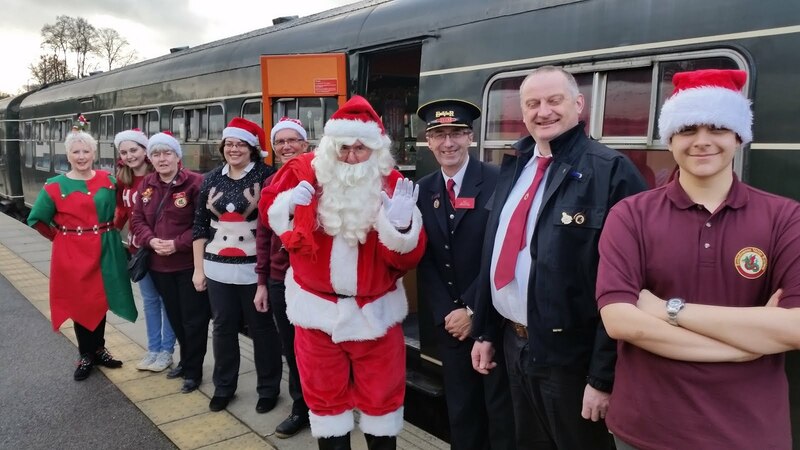 A delightful photo from Peter Watts of today's Santa train team who, as ever, have worked very hard to deliver our quality product, together with a photo of the train ready for the 1000 departure. Also a short video of two departures today. Many happy and contented passengers. All credit is due to everyone who participates in this annual burst of essential activity for the wellbeing of our Railway from Robin who created a sophisticated on line booking system, Leigh who manages the day to day reservations, the dmu team who ready the vehicles and are on hand each departure day to ensure any technical issues are swiftly dealt with, the Booking Halls at Wirksworth and the North Pole who receive the passengers on the day, the on board team including the vital Santa, June who spent most of 2015 acquiring suitable presents and the catering team who round off the experience. Quite a military operation that is universally appreciated by our paying guests. Hectic week this week with progress on all fronts, as usual. On Thursday the PW team were working hard on sleeper changing but just as they thought they could rest, more were delivered! We also hosted a test customer who were on site most of the day. On Friday, it was quiet round and about but Nathan was in the new Booking Office at Wirksworth doing yet more painting although I think the end is gradually coming in to sight with the painting there. A final sort out for the weekend was done too. Today saw full Santa trains all day so many requests were made to the man in red, loads of mince pies were eaten and generally everybody seemed in a good mood. It is probably tradition at this point to mention the weather which is unseasonably mild and not at all like Christmas, it was cooler in August! More full trains to come tomorrow. Meanwhile, down the yard a shunt took place as it is customary to have one a month apparently. There's still a few seats left to see Santa on Wednesday but that's it - book online at www.e-v-r.com/santa if you haven't already and would like to come. Work commenced on the new booking hall entrance ramps. Day two of testing with our customer from France in a dank, miserable atmosphere requiring some patience by our reprepresentative, Joe Marden, but has resulted in further action being required tomorrow to our advantage. 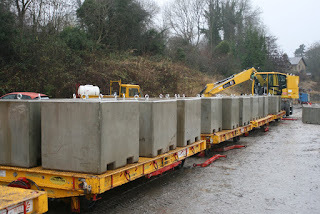 A photo is attached showing that amount of weight needed as part of the test process with each concrete block weighing 3 tonnes. the correct ones in his sack for Wednesday's trains. John B returned to his weekly arithmetic task. A lone EVRA member (another John B) was seen working inside the SO. Chilly but sunny today which gave contractors a rare window of opportunity to replace the forever troublesome Training Room roof. The roof has been leaking in several places but hopefully this will now cure this problem! The PW team headed to The Hannages to do some tidying work there whilst Dan and Derek continued on the BSK in the shed. The Station team did various tasks in the new Booking Office, including installing the first panel of merchandise display boarding. Nasty weather today for Rob and his test customers but they were able to take shelter in the warmth of the Pullman. The PW team also got a good soaking loading and unloading various things in the Shottle vicinity, returning drowned at dusk for a cuppa. The good progress on the area outside the new Booking Office at Wirksworth was curtailed considerably today due to the weather but some planning took place. Work continued on the BSK in the engineerium and the DMU team fettled the Santa train to ensure all is good for upcoming duties this weekend. Today's test customer from Sweden brought a new Pandrol clip remover for its approval for operation on Network Rail. It is shown moving gently at Wirksworth. Many thanks to Rob who hosted the visit. The temperatures have plummeted with a mild frost this morning but the teams remained undaunted. The main event was the operation of our Santa trains with the first train booked by a local school. 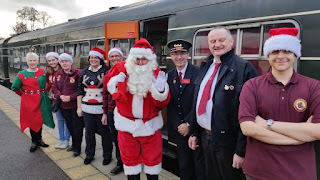 Santa and his helpers ensured satisfaction for all ably assisted by the train crew, Booking Halls at Wirksworth and The North Pole together with the Pullman Catering team. 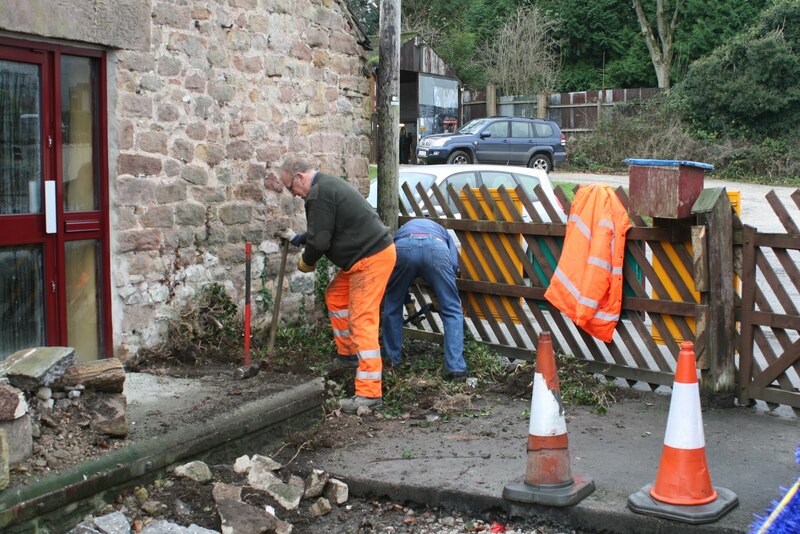 Work started on preparing for a disabled ramp to and from our new Booking Hall at Wirksworth with John and Geoff getting into their stride removing debris from alongside the building. The new facility occupies premises that even predate the construction of the Railway. The PWT concentrated on the track side location of the Mess Hall and its proximity to the large underground sough that runs beneath Wirksworth Yard so that drainage had not been compromised by the new location. 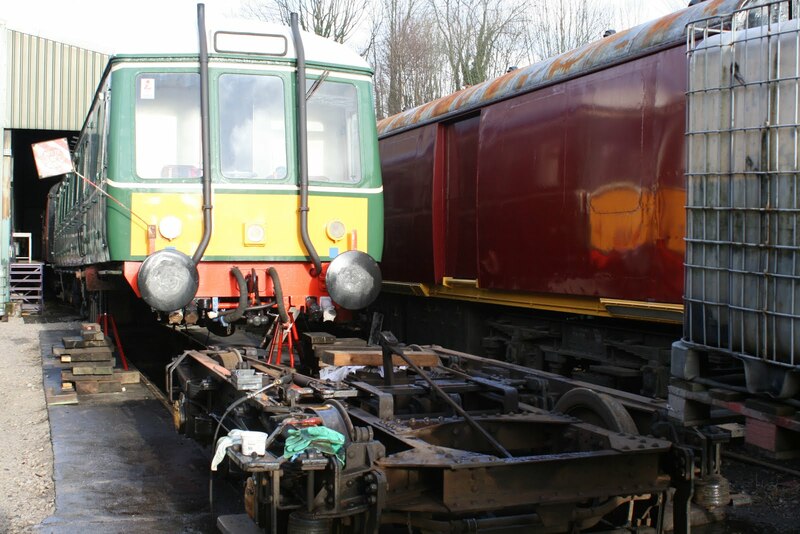 The DMU team continued with the work to restore the "Bubble Car" to active life and the Mark 1 BSK benefited from further window work. Our resident training company candidates made more gentle progress with the reconnection of Road 3 at Wirksworth and a lone worker at Duffield achieved fallen leaf gathering for conversion into compost. A pleasantly mild December day with much activity on our Railway. The Permanent Way Team moved to the area at the south end of Bournebrook Avenue to complete their remedial work there and delegated our resident training company to lay out the sleepers for the reconnection of Road 3 at Wirksworth and they are pictured. Their enthusiasm was boundless. The dmu team concentrated on the bogie removed from the "Bubble Car" to enable a fault with the vacuum cylinder to be cured and took the opportunity to undertake a deep clean. This must be a first for our Railway and its somewhat primitive facilities - at the moment! The Booking Hall continued with Santa booking activity as did the Catering team who cleaned up after last weekend and prepared for Wednesday's visitors. 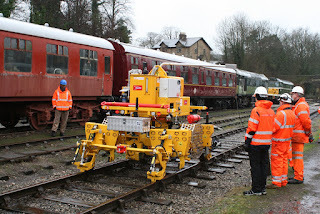 The new Booking Hall at Wirksworth benefited from further work on its electrical installation and the DST progress Cathryn as the day the frame is reunited with the wheels approaches. The LMSCA continued work on the oak veneered interior sliding doors for their BTO and are making a splendid job of replanking the interior of the Guard's compartment. Aye up all, Monday once again. will be put to rest at a later date. The lone LMSCA person was observed still working on the BSK windows (yawn). addition later? Watch this space! Wednesday taking a spin on the Santa train. were postponed until next week. Lots more progress then by lots of persons. Our first day of Santa Trains today was a big success. My thanks go to everyone who went out of their way to support this important commercial event which helps finance necessary projects throughout the winter months. 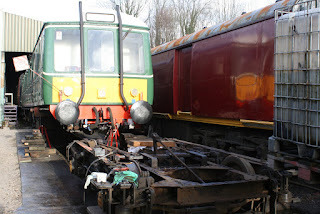 The class 119 received some attention to a leak in the driver's cab and there was lots of shunting done in the yard. Tim Oakes et. al. were busy drilling out boiler stays and the LMSCA were gainfully employed on various projects. Santa's new sleigh features in today's photo. It doesn't really feel like December, it was 14 degrees at one point during shifting 40 boxes of timetable leaflets from the office to the stores. A delivery enabled the new electric heaters to be installed in the new Wirksworth Booking Office, which, little by little, is progressing well. The PW made great strides at the back of Bournebrook Avenue on their dipped joint quest and the Mark 1 men continued their BSK quest in the afternoon. Further Santa bookings were processed as the Santa team turned into final preparations mode. The Pway team took advantage of having no service train this week and worked at Bournebrook Avenue to remove the 15 mph speed restriction. This location has the tightest curve on the line to Duffield and is where BR removed a point and replaced it with plain line. The problem is caused because the joint is on the centre of the curve. The remedy is to cut the rails into four and drill new holes for additional fish plates, to remove central joint. Not an easy task!! John Snell and I journeyed to York to meet up with Network Rail yesterday to commence the resolution of the transfer the freehold of our Railway to the Company and explore the opportunity to acquire the remaining NR land at Wirksworth. This was followed by Beverley and I to attend a concert given by Ronnie Spector in Birmingham's Town Hall.You have to be of a certain vintage to appreciate this! Suffice to say the Ronettes played at the Derby Gaumont in 1964.